THIS WAS, PROBABLY, THE MOST SOBERING EXPERIENCE OF THE TOUR. 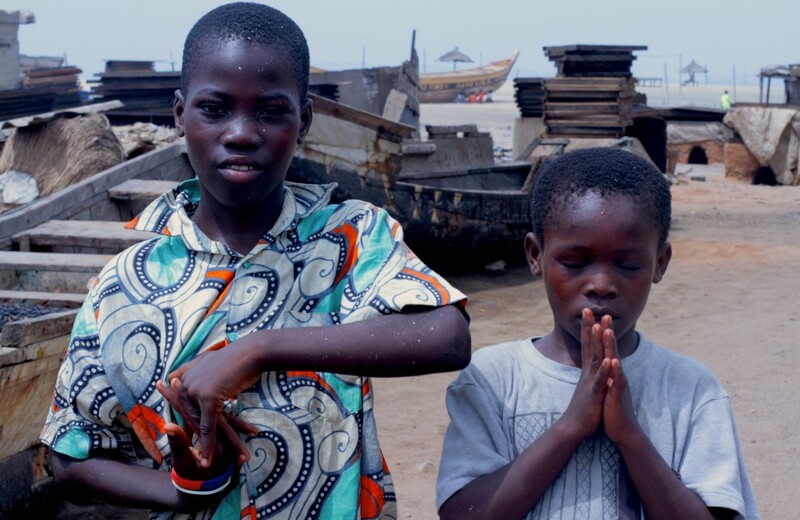 Our visit to Elmina Castle was the experience that no one wanted to miss. It’s “Door of No Return” is a critical symbol in the historical memory of African Americans who are not able to definitively trace their ethnic roots to a specific place or peoples in West Africa. Elmina Castle was erected by the Portuguese in 1482 as São Jorge da Mina (St. George of the Mine) Castle, also known simply as Mina in present-day Elmina. It was the first trading post built on the West coast of Africa and is the oldest European building in existence in sub-Saharan Africa. First established as a trade settlement, the castle later became one of the most important stops on the route of the transatlantic slave trade. The Dutch seized the fort from the Portuguese in 1637. The slave trade continued under the Dutch until 1814; in 1871 the fort became a possession of the British Empire. Britain granted the Gold Coast its independence in 1957, and control of the castle was transferred to the post-colonial government. Today it is a popular historical site and the castle is recognized by UNESCO as a World Heritage Site. On this one-hour guided tour we witnessed firsthand the dank, windowless dungeons that kept 400 men and women each in separate quarters. The tour guide informed us that the stench we were inhaling in one of the female dungeons is a mix of the ocean deposits, blood, urine and feces that had accumulated over the years. Even centuries later, the horrid smell of these fateful encounters still exist. We were escorted through the spacious, airy quarters given to the British governor–a space that is larger than that of the crowded holding cells. We toured the courtyard that captured women would crowd in as the British governor stood from his balcony above and pointed out who he desired to sleep with. The chosen woman would be hosed down and sent up, unwillingly, up a back staircase that led directly to his boudoir. We saw the unventilated holding cells used for those who misbehaved and resisted capture. These death dungeons were a message to others to not get out of line. We toured the church that would have Sunday services for the governor and his staff directly over the male dungeons, drowning out cries of suffering with exuberant hymned song. We passed through the dark, cavernous route the enslaved marched through-one by one, shackled together-from their holding cells to the awaiting ships on the Atlantic Ocean. Touring Elmina can be an emotional experience but transformative for understanding one’s racial history, present and future. Kakum National Park is a 375 square km national park located in the Central Region of Ghana and 45 minutes outside of Cape Coast. The entire area is covered with a tropical rainforest. In the park, gamekeepers are specially trained in the medical and cultural significance of the local foliage. Kakum National Park contains rare animals, including the endangered Mona-meerkat, as well as pygmy elephants, forest buffalo, civet cats, a wide array of birds, and over 500 species of butterflies. 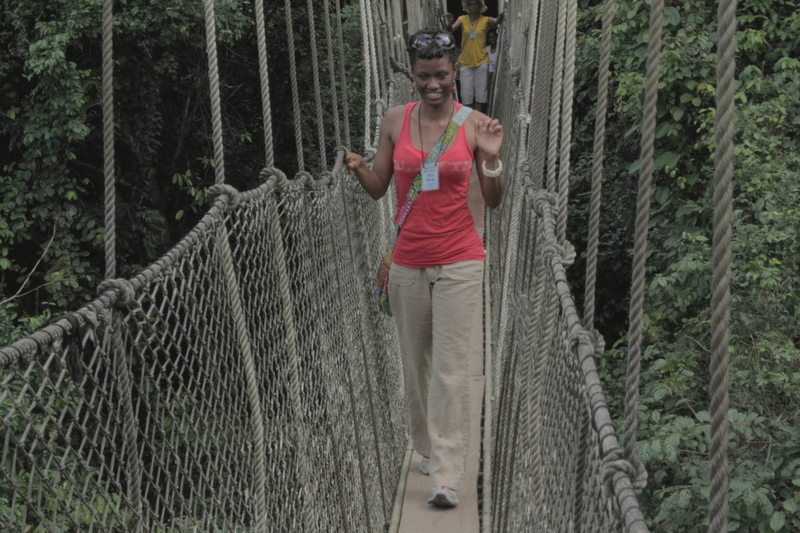 What Kakum is most known for are a long series of hanging bridges at the forest canopy level known as “The Canopy Walkway.” At a 130 feet height, the visitor can approach the plants and animals from a vantage point that would otherwise be inaccessible to people. 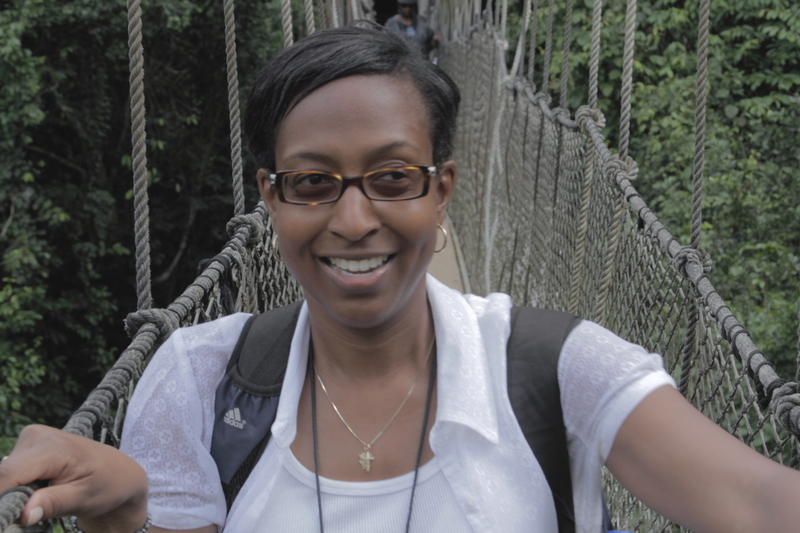 The Canopy Walkway passes over 7 bridges and runs over a length of 1,080 feet. 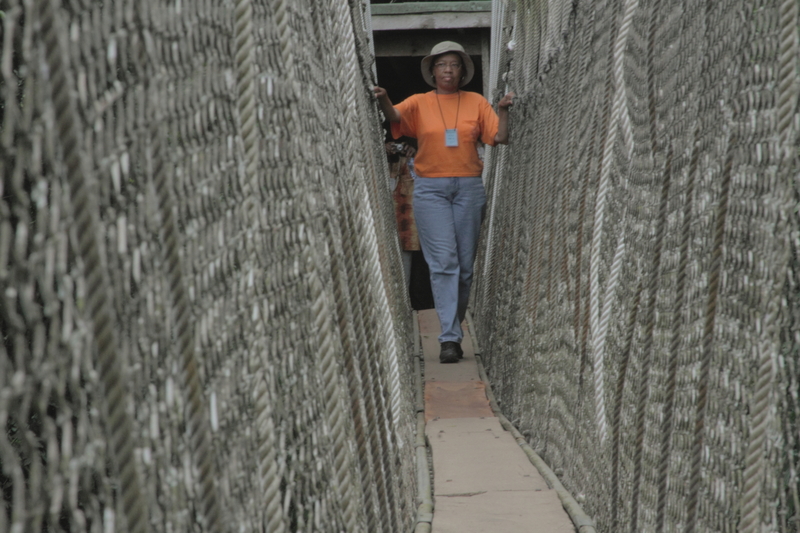 It is secured by a series of nets and wires for safety purposes that were constructed by a team of 9 persons. A majority of the group was able to complete the hearty walk which included a 15-minute incline to the bridge, a 30-minute walk through the 7 bridges and then another 15-minute trek down to the park entrance. There are also a couple of lovely yet overpriced craft shops at the Kakum entrance and an open-air restaurant where we dined for lunch after completing the walk. We were excited about many of the group members who took the walk challenge as a way to conquer their fear of heights. Several even spoke about being able to commune with God in a new way through an appreciation of nature in all its majesty. Kakum was definitely a rewarding experience for all involved. GHANA IS WELL KNOWN FOR IT’S VIBRANT FABRIC PRINTS. You see the gorgeous finished products stacked up in stalls throughout the markets and streets of the city and even on the high fashion runway shows of Marc Jacobs and Diane von Furstenberg. But how exactly are these fabric cloths made? There are a variety of processes for producing these colorful designs. Unfortunately, a lot of the cloths are imported into the country from places like China and Holland where the prints are mass produced for worldwide distribution. This affects the ability of local producers, many who have learned the trade from elder family members, to sell their original designs. We wanted to expose the tour group to this unique cultural tradition and to support the economy of local fabric producers. One style of fabric printing is batik- the most popular form of printmaking in Ghana and other parts of West Africa-where symbols are stamped onto the cloth and then dyed one or more colors. The batik activity was, possibly, the most fun for the EBC group. We arranged a class in Arts Centre for the group to understand the complicated process of making printed fabric cloth. Each person worked with professional batik makers, some who have been in the industry for two decades, to complete the step-by-step process of fabric printing. Step 1: Collect two yards of white fabric cloth. Step 2: Select the sponge blocks that will used to decorate the cloth. There are more than two dozen sponges available with different symbols that communicate particular characteristics, religious phrases or ethical proverbs. Step 3: Dip the sponge in a large bowl of steaming hot wax. Shake off the excess wax and print precisely yet firmly on the white cloth. Create a pattern with one or more of the sponge symbols until the cloth is covered fully. Step 4: Allow the wax prints on the fabric to dry. Select the color dye for the fabric cloth. Step 5: Soak the fabric in the selected color dye and chemical setting mixture for 15-20 minutes. Step 6: Allow the fabric to dry on the ground for 2-3 hours. El fini! The cloth can now be used to make: 1) a shirt or skirt 2) a tablecover 3) a throw for a chair, couch or bed or 4) a wall hanging. After finishing the batik making process, the EBC crew had an enhanced appreciation for the work of fabric cloth makers and sellers.